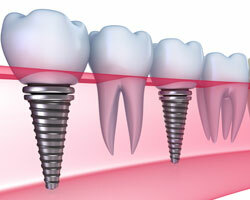 Dental implants are a wonderful blend of science and art. If you’re missing one or more teeth and want a great alternative to dentures or bridges, then implants may be the solution for you. Implants are quickly becoming one of the most ideal treatment for missing teeth.They are securely anchored into the jaw and act as a "root" for special crowns to be custom-fit on the implant in order to maximize the function and esthetics of your teeth. Dental implants can even help to support existing dentures! The surrounding teeth and the jawbone can be better preserved with dental implants and are quickly becoming some of the ideal treatment choices for missing teeth. The possibilities with dental implants are constantly growing however, they may not be for everyone, so be sure to ask the doctors about how they can work for you. While implant restored teeth will not get cavities, they still require routine care. If your implants have experienced wear and tear, we can go over some new options for you.